Michael Hogan joined Glamorgan ahead of the 2013 season. 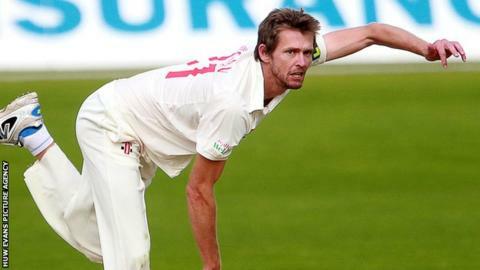 Fast bowler Michael Hogan says he could play on with Glamorgan for another five to six years if his body and performances hold up. The 34-year-old took his tally of Championship wickets to 48 for the season with 3-82 against Gloucestershire. Hogan is set to finish as Glamorgan's top Championship wicket-taker for the third successive season. "I don't think I could play anywhere else (in UK), I love the club" he said. "You'll have to ask (chief executive) Hugh Morris but I'd be happy with another three more years, maybe five or six." Glamorgan begin the final day of the season on 88 for no wicket in their second innings, still 37 runs behind. New South Wales-born paceman Hogan did not play first-class cricket until the age of 28, and is coming to the end of his third season with Glamorgan before heading back to play for Western Australia. "It all depends on how the body feels and if I'm actually performing at this level" Hogan told BBC Sport Wales. "If I'm not performing then it's a waste of time but if the body is good and the club think it's the right fit, then I'll play for as long as they want me." Hogan expects Glamorgan to try to bat out time on the final day at Bristol after Chris Dent's marathon innings of 268 helped Gloucestershire to a first innings lead of 125 runs. "You don't want to lose your last game. It would be nice to go out with a bang and we've got things to play for, small team goals," Hogan added. "If we play well and get points and Northants have a little slip then we can finish fourth. It's a goal we set at the start of the season which would be a big improvement on our last few years." A draw for Glamorgan would almost certainly achieve that aim, with fourth-placed Northants failing to collect any batting points and struggling to save their match against Surrey.